There are several different types of menstrual-related problems. Some of the underlying mechanisms are not fully understood and are likely multifactorial. the menstrual cycle (average cycle length = 28 days – normal range = 21-35 days). 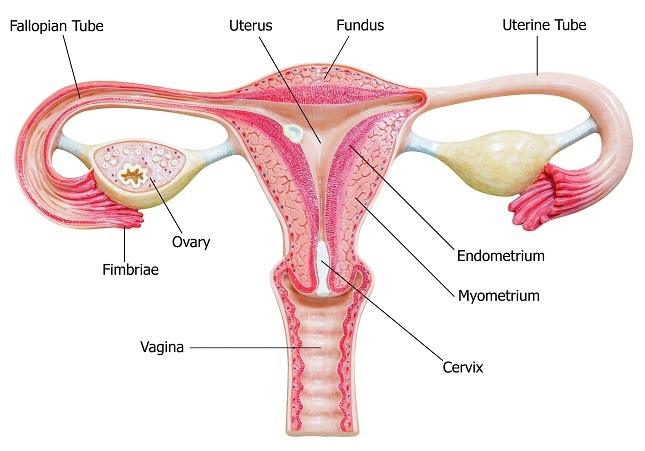 The inner layer of the uterus (called the endometrium) is shed during menstruation. The onset of menstruation marks day 1 of the menstrual cycle. Following the menstrual phase (2-7 days), the endometrium begins to regenerate as a result of stimulation from the female hormone, oestrogen. This is known as the proliferative phase, the length of which can vary among women. 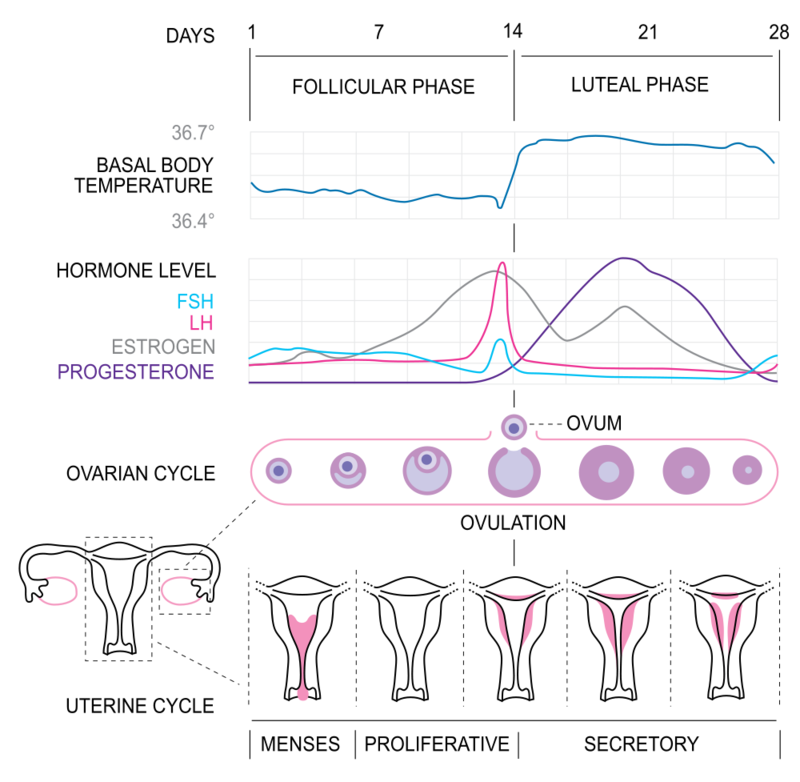 In women with a typical 28 day cycle, this phase lasts around 14 days. Ovulation (release of a mature egg from the ovary) occurs around day 14 in women with a 28 day cycle. Following ovulation, the next stage of the cycle is called the luteal/secretory phase in which the endometrium undergoes changes in anticipation of a possible pregnancy implantation. This phase is fairly constant in women, lasting around 14 days. Should pregnancy not occur, the luteal phase endometrium cannot be maintained and eventually starts to shed, thereby entering the next menstrual phase…and so the cycle repeats itself. With menopause, ovulation stops and the lining stops growing and shedding. All of the changes mentioned above occur as a result of a complex hormonal interplay between the brain/pituitary gland, ovaries and uterus. There are several different types of menstrual-related problems. Some of the underlying mechanisms are not fully understood and are likely multifactorial. However, many problems occur as a result of a disruption to the normal workings of the menstrual cycle. Heavy menstrual bleeding/Menorrhagia – see CONDITIONS page for information on this topic. Primary (when menstrual periods have not started by age 15 years). Secondary (when menstrual periods are absent for more than three to six months in a woman who previously had periods). Oligomenorrhoea is the medical term for infrequent menstrual periods (fewer than six to eight periods per year). The causes, evaluation, and treatment of amenorrhoea and oligomenorrhoea are similar. Painful menstruation, also known as dysmenorrhoea, is a common problem. Most women begin having dysmenorrhoea during adolescence, usually within four to five years of the first menstrual period. Painful periods become less common as women age. Dysmenorrhoea can be classified as either primary or secondary based on the absence or presence of an underlying cause. Primary dysmenorrhoea is thought to be mediated by an inflammatory mediator called prostaglandins. Prostaglandins are formed in the lining of the uterus during menstruation. They cause muscle contractions in the uterus, which cause pain and decrease blood flow and oxygen to the uterus. Prostaglandins may also contribute to the nausea and diarrhoea that some women experience. Secondary dysmenorrhea is caused by an underlying disorder in the woman’s reproductive organs, such as endometriosis, adenomyosis, uterine fibroids, or infection. Dysmenorrhoea tends to be crampy in nature and usually located in the lower abdomen above the pubic bone (the suprapubic region); some women also have severe pain in the back or thighs. The pain usually begins just before or as menstrual bleeding begins, and gradually diminishes over one to three days. Pain usually occurs intermittently, ranging from mild to disabling. Other symptoms that may accompany cramping include nausea, diarrhoea, dizziness, fatigue, headache, or a flu-like feeling. PMS refers to a group of physical and behavioural symptoms that occur in a cyclical pattern during the second half of the menstrual cycle. PMDD is the severe psychological form of PMS. Common symptoms include anger, irritability, depression, and internal tension that are severe enough to interfere with daily activities. Mild PMS is common, affecting up to 75 percent of women with regular menstrual cycles; PMDD affects only 3 to 8 percent of women. This condition can affect women of any socioeconomic, cultural, or ethnic background. PMDD is usually a chronic condition and can have a serious impact on a woman’s quality of life. Fortunately, a variety of treatments and self-care measures can effectively control the symptoms in most women.